As the No. 5 Cal women’s swim team cheered on its four seniors in honor of their last home meet, energy and smiles were abundant. It was sure to be a successful day for the Bears. After defeating Arizona State handily Friday, 172-118, Cal was ready to topple No. 20 Arizona and complete the weekend sweep. The Bears also secured a perfect home record of 6-0, extending their overall record to 7-0. The four senior Bears are Valerie Hull, Jasmine Mau, Maija Roses and Noemie Thomas, all of whom contributed valuable points for their squad on both days of competition. But the second meet, against a ranked opponent, was more pivotal for the blue and gold. Against Arizona, Thomas had the most successful day of the four seniors, finishing with a win in the 100-yard butterfly and hitting the wall more than two seconds before her closest competitor with a time of 52.28. 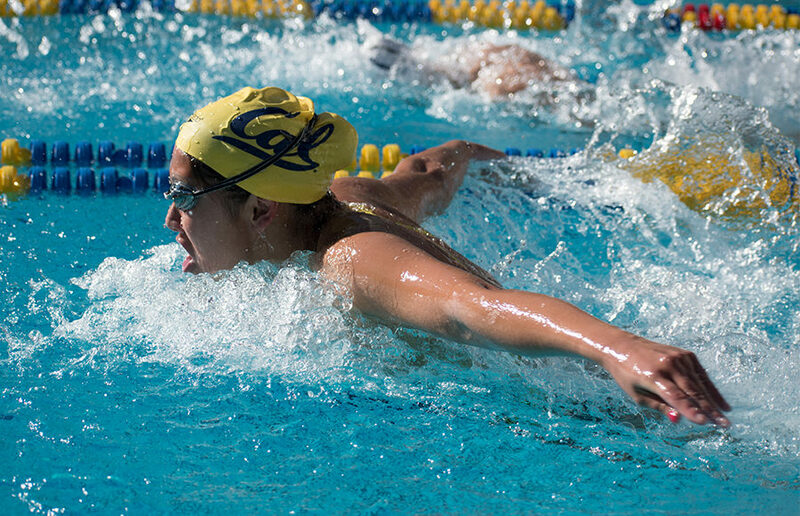 She was also the third leg of Cal’s winning 200 medley relay group. Junior Amy Bilquist and sophomore Abbey Weitzeil had quite the day themselves, each racking up three event wins in their last bout in Berkeley for the season. Bilquist killed the competition in the 200 breaststroke by nearly three seconds, hitting the wall in an impressive 1:54.93. She also came out on top in the 100 backstroke and was the first leg of the winning squad in the 200 medley relay, in which she helped set the pace for Thomas. 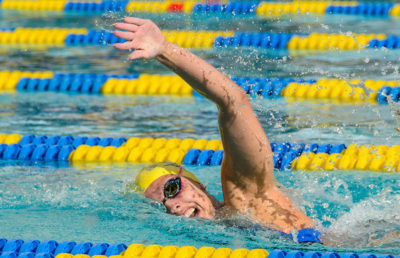 Weitzeil claimed all of her wins in freestyle events — the 50, 100 and 200 relay. In the 100, Weitzeil was the first Bear to hit the wall in a Cal trifecta with a time of 48.98; sophomore Maddie Murphy and freshman Robin Neumann followed, finishing in second and third, respectively. 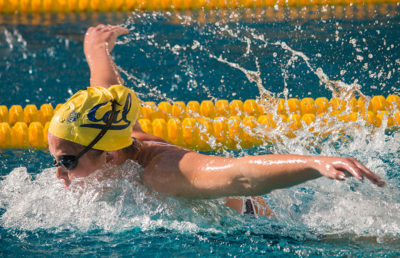 Junior Kathleen Baker, who typically accounts for a handful of Cal’s points in a meet, was fairly under the radar against the Wildcats; Baker did not compete in her signature individual events. Baker was dealing with illness late in the 2017 season and had not competed since Nov. 17 against Nevada. She made her comeback against the Sun Devils on Friday, but the Bears will need her back in full form as they start to wind down their season and approach championship season. Some celebration is in order for Cal, as the team has a lot to be proud of looking back on the weekend. The Bears started the year on a high note, but the road ahead is far from smooth. “Coming off really good Christmas training, we feel good about where we’re at, and today it was more about just celebrating our seniors,” Dunleavy said. Cal will close out its season taking on No. 13 USC, UCLA and none other than mighty No. 3 Stanford.